Episode 6 Greek. Allo is short for allosaurus, a type of dinosaur similar to a tyrannosaurus. Muchomon + OO This wild dinosaur sees Tyranomon as his enemy. His breath is like a hot wind! 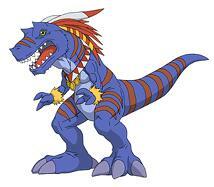 Has the powers of "underground" and "fighting"
V-mon + X This wild Digimon spits out a stream of hot air! Has the power of "fighting"
Hawkmon + Digimental of Courage With his ancient power, he covers the area with a primeval flame! Cuts the opponent's final attack strength in half.